One of my favorite surfaces to paint on, are vintage ceiling tins. Awhile ago I purchased this ornate and very elegant tin and I knew I wanted to paint something special on it. Chickadee & Petunias is one of my latest pieces. I was very inspired by some lovely petunias I had photographed and they were actually the inspiration for this painting. I've also been on a bit of a bluebird painting kick so a sweet little Chickadee was the next little bird I decided I wanted to paint. I often have lots of ideas when I first start painting a tin but in the end, I let the design on the tin dictate how I want to go about painting my design. This tin is so ornate and was such a pleasure to work with...it lead me right in the direction I needed to go in. I've listed this piece on my ETSY shop: www.artfulcreations.etsy.com and I've also been busy making home decor products from the image. The fun part about that is, I was able to transfer the ornate detailing of the tin to the products I made from it. This one was a real pleasure to paint. Sandi Bodnarchuk of Sandi'sstuff has written this wonderful tutorial about how to alter a train case. Please note that all of the photographs that accompany this tutorial are the property of Sandi and are not to be copied. For more information about Sandi and to learn how she came to do these wonderful train cases, please read the interview with Sandi that follows the tutorial. Sandi, from everyone here at Etsy Cottage Style, thank you so much for offering us this wonderful tutorial and for sparking our creative juices! Let me begin by stating I am no expert in refurbishing train cases and I learned simply by trial and error. However, if I can help anyone who has always had the desire to make an old train case into a beautiful keepsake or heirloom quality item , I will be happy to share what I have learned. There are a lot of old train cases out there – however the really old ones have the best bones because they are more squared off than the newer ones (i.e. fiberglass). The squared shape is easier to work with as was the type of material used to make them. The fiberglass ones tend to have a rougher exterior. I start off by totally gutting the inside carefully. I say carefully because I try and save what I have taken out so that I can use it as a template for the new fabric I will be lining it with. If your train case is like new condition inside and you wish to leave it. You can simply embellish it with extra lace, trims or roses, prisms or whatever you feel will partner well with what is already there. Needless to say, your outside décor will have to co-ordinate with what is already inside. Ok – we will go with a total gutting for the purposes of this tutorial. Once you have gutted the interior and set your templates aside – give the outside a light sanding. Don’t worry if there are slight dings or scuff marks – that just adds to the beauty of your treasure. I then prime the exterior with a white primer. Let that dry really well and then start painting whatever colors you have decided on. There is usually a lot of trim pieces on train cases and that is where I tend to put most of my colors, leaving the largest areas either white or white with a light color wash.
Now if you are able to paint roses or use a stencil, the fun part begins. I usually paint my own roses, but you are free to use stencils, decals or decoupage whatever you envision your train case should look like. I often do a collection of handmade flowers on the lid, but that is just me. Take a pretty ribbon and tie it to one end of the handle and then just keep going around and around the handle until it is all covered with ribbon. You can then glue a bow at each end or at one end , whichever you prefer. Be sure you seal your art work with two coats of a good sealant to protect it. This of course should be done before you attach fabric flowers or ribbons. Let me just go back to the interior for a second for those of you who will be totally redoing the inside. I take my template and cut out new pieces adding an extra inch all around. I then cut out lightweight cardboard pieces with the same template. I use a white (clear drying) glue and totally brush the cardboard with glue. Gently place your fabric on the piece of cardboard and using a little extra glue, fold the extra inch to the inside all around. I usually do the bottom first and then add the sides after that so that it reaches over the bottom edge a bit. I glue my pieces into the train case with heavy duty hot glue. Your ruffles and/or ribbon trims will be hot glued in place last of all. Always remember to cut an extra salvage edge when cutting the fabric to fit your cardboard pieces. I like the cardboard pieces because you can fit them into the train cases before you glue the fabric on so you will know if they fit well. This way you are not wasting any fabric if you happen to make a mistake in cutting the cardboard. I hope this little bit of information will give you the encouragement you need to try and do your train case. If you have any other questions, please do not hesitate to ask. Good Luck and when you are done please send me a picture of your wonderful keepsake train case. We spent some time getting to know Sandi Bodnarchuk of Sandi'sstuff after she so kindly offered us the above tutorial on how to alter a train case. Sandi is a long time and active member of the Etsy Cottage Style group at ning. Her etsy shop is filled with beautiful work, all self taught through Sandi's love of creativity and beautiful things. Please note that the photographs in this interview are from Sandi's etsy shop and are not to be copied. Sandi, what inspired you to alter a train case? My inspiration for refurbishing a train case pretty much came from the decorator boxes you see in the craft stores. They are nice, but just lack a personal touch. I thought a train case would be the perfect way to either store your memories, your heirloom collection of old handkerchiefs or gloves or just fill it up with either items from a trousseau shower or baby shower. You are not only giving someone a gift, you are giving them a way to store their cards and special items from a special occasion. When did you do the first case? I did my first case about 5 years ago and it sold immediately for good money. Times have changed a lot since then and trying to sell anything right now is a slow process. I have another couple primed and ready to be finished, however, I will wait until I find a new home for this one before I do another. They are a lot of work, depending on how much creativity you put into it. Some people do not refurbish the inside, but I feel it is unfinished if you just leave it the way it was. I like to have the inside co-ordinate with the outside. Sometimes I do hand painted flowers and handmade fabric flowers, just depends on what I feel will suit the particular case. You do other work as well -- where do you find your inspiration for everything you create? What is your background in art and crafting? Did you study at school, or are you self taught? I am also a self taught rose painter. I just decided one day I wanted to paint roses so I just kept on trying until I got a result I could live with. I am always trying to improve my finished product and have a feeling I will never be totally satisfied. fabrics, which I find useful to this day. I have decorated many homes when called upon all just for the fun of doing it. I have painted murals free hand and did all the window dressings in my daughter's new home. I can usually visualize what a finished product will look like even when some people have their doubts as to my color combinations or way of doing things. In the end, they usually agree with what I have chosen. You can't be afraid to stretch your imagination when doing anything creative. I especially love Victorian items and try and do a number of them mixed in with all my cottage style items. morning with an idea in my head and just can't wait to get into my craft room and begin creating. I keep a pen and paper by my bed because there have been times when I wake up in the middle of the night thinking of two fabrics that would be so great together and I know I will never remember which two in the morning - so I write it down. You don't have a blog at the moment. Is something you are thinking about doing in the near future, as another side of your creativity? I do not have a blog at the moment but definitely want one. Being that I am a fuss budget, and would like a nice banner and a few of the bells and whistles, I am waiting until I can get someone to help me with it. I know they are easy if you just want a regular blog, but I don't want to put a lot of effort into something I won't be happy with. Did I mention I am fussy?? I will get one - soon I hope - and then I can wake up in the middle of the night thinking of things to put in my blog! The creativity never ends and I love it all - I sincerely hope it shows in the things I create. I always try and make items that I would be happy to receive if someone were to give them to me. There are times when I end up keeping things just because I can't bear to part with them. One of these days I am going to have to de stash - now that will definitely keep me up at night. 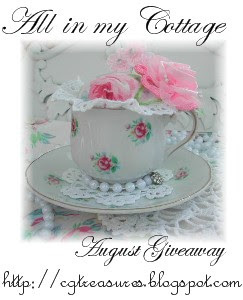 One of our ECS members, Tracy of Shabby Addict is having a giveaway on her blog. All you need to do is leave a comment on this post to have a chance at these delicious goodies. Contest winner will be announced on Sunday the 17th -- still time to enter!! *photograph is from Tracy's blog and is not to be copied or reprinted. For those members who have joined the group to participate in the Love and Hope Altered Pass Around Book, here is some information from Jewel which has been posted on the Etsy Ning Site, but we're reposting it here for a reminder or for those who may not have seen this message. I thought I would start a new discussion on the book so that it's easier to find the specifics of the pages, etc,. If anyone has emailed me since the last time I posted on here about this book, the week of July 22nd through July 28th, I did not receive those emails due to a spammer that hijacked my email account while I was on vacation. You can read more about it on my blog if you are interested; My email account was hijacked. It is rectified now and you can email me again at the same email address. I have decided on how this Book will work. I have listened to and read everyone's suggestions and I totally appreciate all of them. When I started out, I had wanted to use an actual book that would be passed around and the pages altered. I had always wanted to do one and thought that a charity would be a good cause to make one. But with all of the interest, and thank each and every one of you for your interest in it, I have decided that each doing a couple of pages and then sending them to me to be bound together would be best. I like the idea of saving the shipping money to be donated to the charity. I will also be making banners that will be sold along with the books so that those that chose to donate can do so in another form other than the purchase of the book. Also if anyone else wants to add other things to be auctioned off during that time for the proceeds to go to NCCS, then that would be great as well. But we will discuss that at a later date. I do like the idea of doing two books, one to give and one to keep. So, I hope you all don't mind doing two pages each, one for each book. I feel that it would be best do make the pages from card stock. You can then paint, glue, sew, write or whatever you would like to the pages. I would ask though that you try to keep the things that you glue or sew or whatever embellishments you put on the pages as thin as you can so that the book does not become too bulky to bind. I would like for you to decorate the front side and then on the back side I would like for you to either write a little about what you feel Love and Hope means to you or a Story you would like to share or some poetry or words of encouragement or whatever you feel would convey a message of Love and Hope to either the children going through such a horrific ordeal or to the purchaser of the book. Or maybe even a little bit about yourself. If you choose not to do this, that is totally fine too. You as the artist can make that call. As far as the size of the pages, I feel that a book that is 7" wide by 9" tall would be a good size. Big enough to have enough room to decorate but not too big. You will need to leave a 1' wide strip on the left front side of the page for me to use for binding, so your actual work area is 6"wide by 9"tall. You may start on these at any time and send them in to me. The deadline for sending them to me will be November 1st. That way I have plenty of time to get them bound for auction so that we can do it for the Christmas season. I think the auction should run November 20th to November 30th. We can do a ten day auction that way ending on Sunday which is a good day for eBay sales. We can start it in the evening that way it will end in the evening. During that time anyone else that would like to donate an item to be auctioned off can do so as well. But, once again we will discuss that at a little later date. If you have any questions, then please feel free to either contact me directly or within the forum and I will answer any questions you may have. Good luck all! 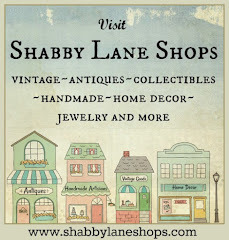 When you are ready to send me your pages, then just email me at shabbyboutique@charter.net and I will give you my address so that you can send them to me. Thank you all again! All In My Cottage, so head on over there and sign up before August 17th. The second challenge contest entries for Mind Wide Open have been received and are now up for voting. Click on the badge and please have a look at this spectacular art and see what others have been doing with the image that was given for the contest. Hopefully you will be inspired to participate in the September challenge!